Reel Talk Online: Early Review: "Transformers: Dark of the Moon"
Early Review: "Transformers: Dark of the Moon"
"Years from now, they are gonna ask us: where were you when they took over the planet?" Never mind the ridiculous subtitle. It's really just a precursor for what is to come from the rest of the movie. And Transformers: Dark of the Moon doesn't even try to play down its idiocy. On the contrary, it plays right to it. So, let's call this what it is: rise of the machines (which would have been a nice alternative subtitle, if it wasn't taken by the last Terminators installment). 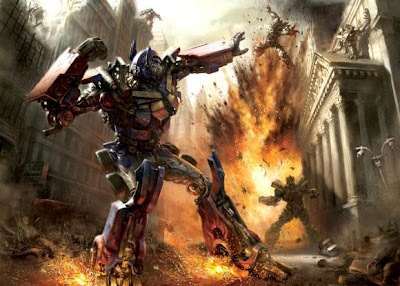 The transformers are the far more interesting characters to watch and the human army mob, led by the not even popcorn-worthy Shia LaBeouf, are mere pegs in their universe. Once again, the Decepticons wage war against the Autobots when they learn about a Cybertronian spacecraft hidden on the Moon. The Decepticons then plot to use this mysterious fixture to take over the world. The agents are really there just to mediate the chaos, and not very well. You could just imagine the epic action scenes that drag on for nearly forty-five minutes at one point. If you catch it in 3D, you're going to feel like glass and fireballs are being thrown at you. In other words, it's like an apocalyptic movie experience, in 3D. With Megan Fox ejected from her primo position as the pouty princess and love interest to LaBeouf's makeshift hero, the equally "talented" model Rosie Huntington-Whiteley smoothly steps up to the plate. And, really, besides the aesthetic differences, they're two of the same. Both make wooden actresses who could barely make a sentence of script believable. And this is Transformers 3, it really doesn't have to be that difficult. But leave it to popcorn movie king director Michael Bay to turn a negative into a positive. He played to Huntington-Whiteley's, um, assets by nearly blinding the audience with random shots of her rear end and even emptier frames of her staring emotionless in the camera, with her hair appropriately flowing in the wind. At times, it's like a bad 80s music video. There's really nothing else worth mentioning about the sub zero plot, except that John Turturro, Frances McDormand, John Malkovich and Ken Jeong prove that they're so good they could even shine through their weakly-written characters. They are truly invincible. Particularly Jeong and Malkovich as LaBeouf's stiff-neck colleagues will keep audiences in stitches. Too bad their screen time is limited. Tyrese is by no means a good actor, but at least he knows how to play to a true popcorn flick. Kudos to that. But even when LaBeouf was trying to be funny and cute, it came off annoying and...not cute. 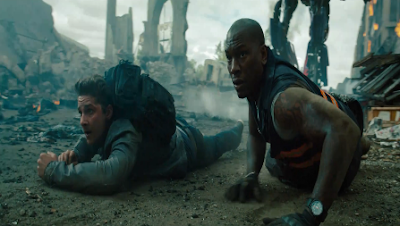 If there's another installment, and there probably will be, Tyrese should step into the lead role. And if there is another movie, Bay should probably cut out the fat (you know, most of the scenes where there is any dialogue), and just leave in all the action scenes. A run time of more than two and a half hours seems mind-boggling for a movie like this, that's not called Fast Five. Although there are several eyeroll-worthy scenes in the movie (like the single tear streaming down LaBeouf's face; no scene was ever that deep), the movie is actually visually fun to watch. You might get a kick out of watching it on mute. But it's doubtful that the DVD will be as entertaining, since the 3D effect is really the charmer. Turn your mind way off to watch this one. I think I'm bias too because I grew up with them. But your absolutely right about the plot. The robots are so much more interesting. That's why I think the majority of the human scenes should've been cut out. @Brittani Burnham i grew up on the cartoons as well, which makes me even more critical of the movies :). definitely the human scenes could have been cute. there was no reason for this movie to be this long. the humans added nothing to it. @Daniel LOL. i loved watching the cartoon as well, which i find nothing like the movies. It’s an improvement over the second one, which isn’t saying much, but still is a very fun blockbuster filled with action, destruction, romance, robots, and Michael Bay once again letting loose on all the special effects and action there is to let loose. Good Review Candice! Check out mine when you can! Your review might be one of the first where I see Ken Jeong being labeled as good, lol. I'll watch this on Monday.